A small part of the Tohoku line from Nasu-Shiobara to Utsunomiya. This is a high-speed line for the Shinkansen high-speed trains. The lines gauge is 1435 mm and it is electrified with overhead wires 25 kV AC at 50 Hz. 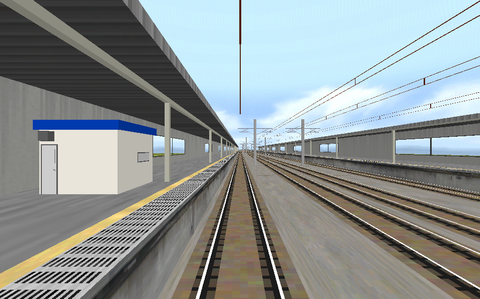 The line simulated has no details at all in the landscape and sparsely detailed stations. It is however a route to test the class E2 Shinkansen train. A few objects are missing when loading this route in OpenBVE. Probably because of this, the tunnels in the route look weird. The Tohoku line at Wikipedia. This route was originally made for the class 200 Shinkansen trains. The files for that train has however disappeared from the Internet >10 years ago. Because of that the class E2 Shinkansen train is used. The creator's website, download English version of route, and then structure (objects) and sound.